"Seeing a storm this bright at such a low latitude is extremely surprising," said Molter, who spotted the storm complex near Neptune's equator during a dawn test run of twilight observing at W. M. Keck Observatory on Maunakea, Hawaii. "Normally, this area is really quiet and we only see bright clouds in the mid-latitude bands, so to have such an enormous cloud sitting right at the equator is spectacular." This massive storm system, which was found in a region where no bright cloud has ever been seen before, is about 9,000 kilometers in length, or one-third the size of Neptune's radius, spanning at least 30 degrees in both latitude and longitude. Molter observed it getting much brighter between June 26 and July 2. "Historically, very bright clouds have occasionally been seen on Neptune, but usually at latitudes closer to the poles, around 15 to 60 degrees north or south," said Imke de Pater, a UC Berkeley professor of astronomy and Molter's adviser. "Never before has a cloud been seen at or so close to the equator, nor has one ever been this bright." A huge, high-pressure, dark vortex system anchored deep in Neptune's atmosphere may be what's causing the colossal cloud cover, said de Pater. As gases rise up in a vortex, they cool down. When its temperature drops below the condensation temperature of a condensable gas, that gas condenses out and forms clouds, just like water on Earth. On Neptune, however, methane clouds form. As with every planet, winds in Neptune's atmosphere vary drastically with latitude, so if there is a big bright cloud system that spans many latitudes, something must hold it together, such as a dark vortex. Otherwise, the clouds would shear apart. "This big vortex is sitting in a region where the air, overall, is subsiding rather than rising," said de Pater. "Moreover, a long-lasting vortex right at the equator would be hard to explain physically." If it is not tied to a vortex, the system may be a huge convective cloud, similar to those seen occasionally on other planets, like the huge storm on Saturn that was detected in 2010. However, such a cloud would be expected to smear out considerably over a week's time. "This shows that there are extremely drastic changes in the dynamics of Neptune's atmosphere, and perhaps this is a seasonal weather event that may happen every few decades or so," said de Pater. 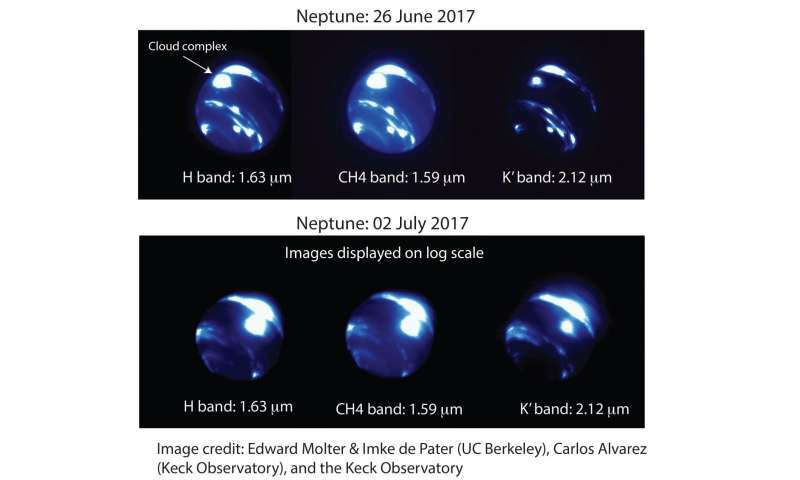 The discovery of Neptune's mysterious equatorial cloud complex was made possible by the new Keck Visiting Scholars Program, launched this summer, which gives graduate students and post-doctoral researchers experience working at the telescope, while contributing to Keck Observatory and its scientific community. "This result by Imke and her first-year graduate student, Ned, is a perfect example of what we're trying to accomplish with the Keck Visiting Scholars Program," said Anne Kinney, chief scientist at Keck Observatory. "Ned is our first visiting scholar, and his incredible work is a testament to the value of this program. It's just been an outrageous success." "Ned had never observed before, and he's very bright, so when Anne told me about the program, I knew he would be the perfect student for it," said de Pater. "Now that we've discovered this interesting cloud complex in Neptune, Ned has a running start on a nice paper for his Ph.D. thesis." "I loved being at Keck. Everyone was extremely friendly and I had a ton of personal interaction with the support astronomers and observing assistants," Molter said. "Being able to go behind the scenes to see how they run the telescopes and instruments every day, getting 10 nights of observing and engineering time on the telescopes and going up to the summit twice to see the incredible engineering behind this gigantic machine has turned me from a student into an actual observer. It was an incredible opportunity." Having a better understanding of Neptune's atmosphere will help give astronomers a clearer picture of this icy giant's global circulation. This has become increasingly more important in the exoplanet realm, as a majority of exoplanets found so far are nearly the size of Neptune. While scientists can calculate their size and mass, not much is currently known about exoplanets' atmosphere. We need an orbiter around Neptune comparable to the Cassini probe at Saturn. It will take a large and expensive launch vehicle, or a really long coast phase, but the benefit to science would be well worth it. How these intense storms form so far from the radiant energy of the Sun is a huge problem for planetary/atmospheric scientists. There is no conceivable explanation without considering the electrical connection all of the planetary bodies share with the Sun. @cantthink, methane melts at about -200C. Water melts at 0C. Must be your math allergy again. Could Neptune simply have been hit by a very large asteroid ? And what we are observing is the effect of an impact ? Do we have any observations or data prior to the discovery date ??? Mkay... And that explains these planet sized storms that are visble across the Solar System in what way?